For several minutes on Thursday, the world was safe from Donald Trump's tweets. 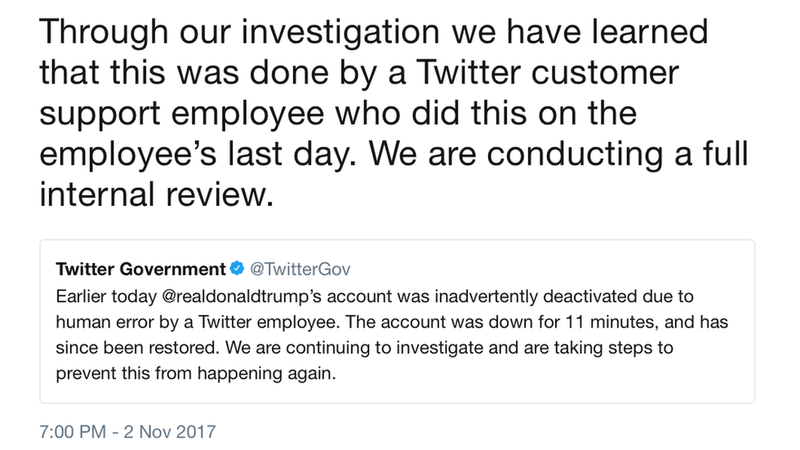 In what the social network company said was a move made by a customer service rep of their last day of work, President Trump's personal Twitter account was deactivated for 11 minutes. The move prompted a lot of joking, but it's actually not a laughing matter. Some have argued that the president should be banned for violating the social network's terms of service, and certainly a case could be made for that. Senate Democrats have long been close allies of the tech industry. But this week, Axios' Kim Hart reports that it became clear that they've become vocal skeptics. Why it matters: Tech companies have enjoyed cozy relationships with Democrats in Washington over the past decade and are generally aligned with them on policy issues. But Democrats are enraged over how Google, Twitter and Facebook handled the Russian exploitation of their platforms during the election, and their frustration was on full display during nine hours of tense hearings this week. In many cases, Republicans — who have never been tech's biggest cheerleaders — actually went easier on the executives. Sen. Ron Wyden: "To fight back on this espionage, Americans have to rely on our marketplace of ideas and the institutions that support it. Today, you three represent those institutions. You've discussed your response to these attacks. It is self evident that in relation to the power your platforms now have, in the past election, you failed." Sen. Kamala Harris: "With great success comes great responsibility. You are the modern town square and the modern postmaster. You are the phone company and the yellow pages. You are the newspaper and the radio broadcaster and the television station. And you are the emergency alert system." When the companies couldn't answer her question about the revenue they earned from legitimate ads running on Russian propaganda pages, she fired back, "I find that very difficult to believe," and demanded they put an executive in charge of tracking it. Sen. Dianne Feinstein: "I don't think you get it. What we're talking about is a cataclysmic change...What we're talking about is a major foreign power with the sophistication and ability to involve themselves in a presidential election and sow conflict and discord all over this nation...You've created these platforms, and now they are being misused. And you have to be the ones to do something about it -- or we will." Sen. Mark Warner: A former tech executive himself, Warner said he was frustrated at the companies' dismissive response to congressional inquiries. "Russia's actions are further exposing the dark underbelly of the ecosystem you have created...Candidly, your companies know more about Americans in many ways than the United States government does. The idea that you had no idea that any of this was happening strains my credibility." Sen. Joe Manchin: "You all are one of the largest distributors of news...You cannot allow this to go on. What you are allowing…is threatening the security, safety and really the sovereignty of this nation.... I wish your CEOs were here. They need to answer for this." Our thought bubble: While there's no real threat of slapping new regulation on tech companies — other than possible political ad disclosure requirements — the fact that Democrats are publicly shaming tech companies signals a shift in how Washington views Silicon Valley. Analysts who were concerned about iPhone 8 demand or iPhone X supply received plenty of reassurance when Apple released its earnings on Thursday. They didn't get much more detail out of CEO Tim Cook on the ensuing conference call but the numbers really spoke for themselves. The numbers: The company reported per-share earnings of $2.07 (vs analyst estimates of $1.87) on revenue of $52.6 billion (vs $51.2 billion estimated). And for the current quarter, which runs through December, it forecast record revenue of between $84 billion to $87 billion. Apple wouldn't have been able to turn in the kind of results it did without pretty decent iPhone 8 demand nor could it forecast such a strong holiday quarter unless it could supply a pretty decent number of iPhone Xs. And it wasn't just the iPhone. The iPad showed improvement, the Mac had a good quarter, and Apple's services posted record revenue. Geographically, China rebounded after several slumping quarters, while other emerging markets saw 40% growth, with sales in India doubling year-over-year. Reaction: Loup Ventures' Gene Munster pointed out that this was the first time since December 2014 that Apple had growth in every product area and every geography. "Tim Cook is giddy, and he should be," Munster said in a research note Thursday night. Apple Watch unit growth was more than 50% for the third consecutive quarter (though Apple didn't give specific numbers). Cook insisted that manufacturing of the iPhone X is going well, but maintained he couldn't predict when supply will match demand. He wouldn't say how the iPhone 8 Plus sales compared with the standard model, but did say that it is off to the fastest start of any Plus model, which he said was a positive surprise. On tap: The iPhone X arrives in stores, briefly, before going to the first few people who have been camping out for days. Former Apple executive Jean-Louis Gassée tweeted Thursday night that there were more than 100 people outside the Palo Alto store. They might be better off than those looking to get one in San Francisco. CNET reported that a thief made off with more than 300 iPhone Xs by robbing a UPS truck parked outside the Apple retail location. And, Axios' Stef Kight revisits the trend in Google searches for "iPhone problems" during new releases. Trading places: Bryan Carter is out as CEO of DoubleDutch after just a couple of months, TechCrunch reports, with founder Lawrence Coburn returning as CEO. The company said Carter will remain with the company. ICYMI: VMware is buying VeloCloud amid a deeper move into networking, TechCrunch says...Waymo signed a deal with AutoNation to repair and maintain its self-driving car fleet, per Reuters...Hewlett-Packard Enterprise is selling its iconic Palo Alto headquarters and will move into other spaces, including offices in San Jose recently built for its Aruba subsidiary, BI reports...Qualcomm is suing Apple. Again. This time, it's alleging that Apple breached confidentiality provisions of its chip contract, Reuters reports. In honor of #NationalSandwichDay, we have what could be the Brit's answer to #burgergate.